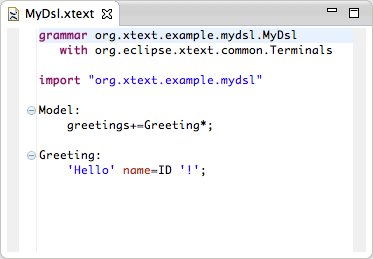 With Xtext you can easily create your own textual language. The structure of the language is defined in an Ecore model. This model can be automatically derived from the grammar, which allows quick turnarounds in the beginning. But in the long run, this model becomes an increasingly important API to the language. You want to fix it and make it a first class artifact: You are switching from an inferred Ecore model to an imported one in the grammar. Traditionally, you use EMF's tree editors to edit Ecore models. That can be cumbersome as the tooling is not the nicest to use. Furthermore, the Ecore model only describes the declarative part. Behavior, such as the body of EOperations or the code for derived EStructuralFeatures has to be woven in either from additional models or directly in the generated code. These and more issues are addressed by Xcore. 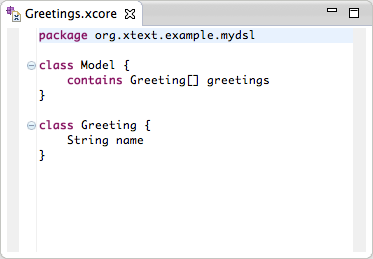 Xcore allows to specify Ecore models textually, including the behavioral parts and the code generation parameters. Having a single source of information facilitates the maintanance of such a model drastically. Xcore is shipped with EMF. Create an Xtext project File > New > Project > Xtext Project. The defaults are fine. This will create the usual four projects for your Xtext language in your workspace. 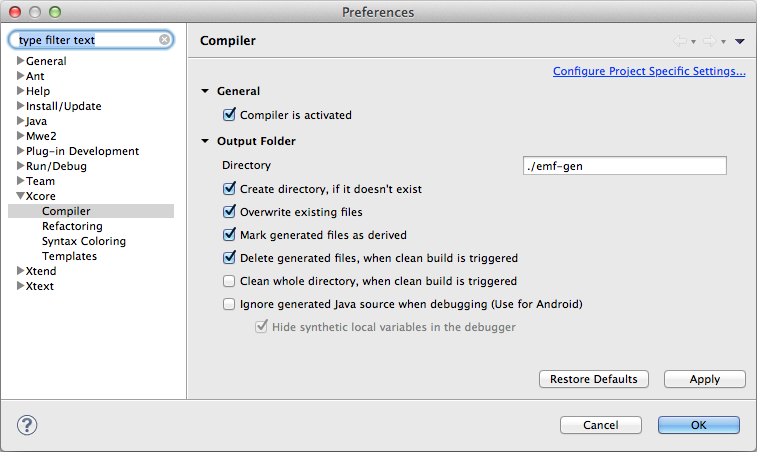 You have to add a dependency to org.eclipse.emf.xcore in the MANIFEST.MF of the project. Now generate the language infrastructure Run As > MWE2 Workflow. There should not be any error. Launch a new Eclipse workbench Run > Run Configurations > Eclipse Application > Launch Runtime Eclipse and enjoy your language in action. For the geeky fun of it: As Xcore is itself implemented in Xtext with an imported Ecore model, this lays the foundation to replace Xcore.ecore with Xcore.xcore and thereby bootstraping it. Does this include the Xcore 2 Java Generation or do i have to use the eclipse builder for that? org.eclipse.xtext.parser.ParseException: java.lang.IllegalStateException: Unresolved proxy platform:/resource/org.xtext.example.mydsl/model/Greetings.xcore#/EPackage/Greeting. Make sure the EPackage has been registered. I have started to use it, and using DSL to define EMF model is really cool (in my opinion much better than clicking in the ecore tree editor). I think the project deserve a bigger audience. @John Are you using the latest RC4 builds of both projects? 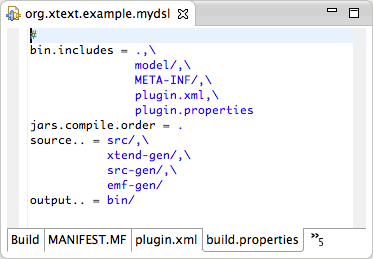 Please also make sure the EPackage is correctly registered in the plugin.xml of the org.xtext.example.mydsl plug-in. If it's empty, delete it, then first rerun the Xcore generator and then the Xtext generator. @Jan Do you know if any Xcore standalone generator exists? Based on that writing an IWorkflowComponent adapter should be straight-forward. Jan, do you have a longer example of the workflow? I'm moving from a genmodel based implementation, and it's not clear what to do w/ the Standalone setup, or if I even still need that. StandaloneSetup is still necessary, but you should not have to register the .ecore and .genmodel files of your Xcore model. I know it is an older post, but it seems there isn't an o.e.emf.xcore plugin to require (step 6), however there is a org.eclipse.emf.ecore.xcore plugin. Same thing? I know it is an older post, but it seems there isn't an o.e.emf.xcore plugin to require (step 6), however there is a org.eclipse.emf.ecore.xcore plugin. @Raphael This should be the right one. I have an xcore project but I want to customize the save operation. I want to generate ecore model when the xcore file is saved. Is it possible? if yes, how? @Parisa Your question is not related to Xtext but to Xcore only, so why not as it in the EMF forum? Because I must save the xcore as ecore or better to say with xmi format programmatically but it's the answer which I taken.